Owen Clarke Design (OCD) are pleased to announce that design is well under way on a new 23m lifting keel, performance blue water custom cruising yacht for a Scandinavian client. Construction will commence in Europe at a yard yet to be determined in the Autumn of 2017. OCD began consulting for this experienced yachtsman, who has a background in engineering, in the Spring of 2016, helping him to formulate a working concept design based around his ideas and needs. This process culminated in a conventional design ‘kick off’ meeting in Les Sables d’Olonnes, prior to the start of the Vendee Globe. Work is now proceeding developing the design further; a yard and supplier tender package will follow in the next few months. Limited to an air draft of 30m, the owner’s requirements are for a yacht capable of fast trans-oceanic passages that is simple for him and his family to sail and manoeuvre. It was clear early in the process that a lifting keel would be essential to in order to access some of the intended cruising grounds while at the same time allowing the overall displacement of the yacht to be in line with the performance requirements. A high aspect fin keel produces an efficient foil for sailing upwind combined with a deep draft lead bulb to provide stability with a lower mass than a conventional low aspect ratio fin. 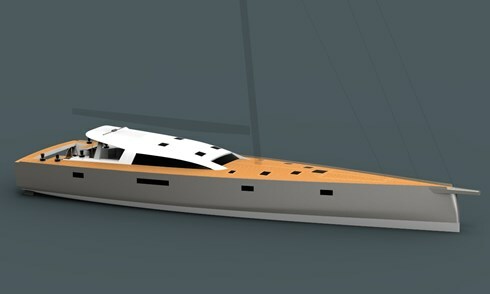 The minimum draft of the yacht will be 2.4m with a target sailing draft of 4.5m. In order to increase the cruising payload and stay within the desired performance parameters the yacht will be constructed of a hybrid of carbon and glass composite on a foam core. The hull shape aft is driven by performance and interior volume requirements, requiring that the yacht be fitted with a twin rudder system which also satisfies the handling characteristics the owner desires and is consistent with the requirement for minimum draft, especially when mooring stern too in shallow harbours. The interior of the yacht is entered via a protected outdoor seating area which leads into a raised saloon with panoramic view that serves as a watch-keeping, dining and lounge area. The two large guest cabins are situated aft and the owner’s en suite accommodation is immediately in front of the mast. A further four berths in pipe-cots can be made available as required further forward in combined utility/storage compartment. Among the systems incorporated into the yacht is a tender garage capable of storing and launching a 3.6m RIB.